This easy circular walk is just under 4½ miles and although it can be completed in under two hours it is better to take at least a half day or more, so that you can explore some of the historical sites and amenities along the way. 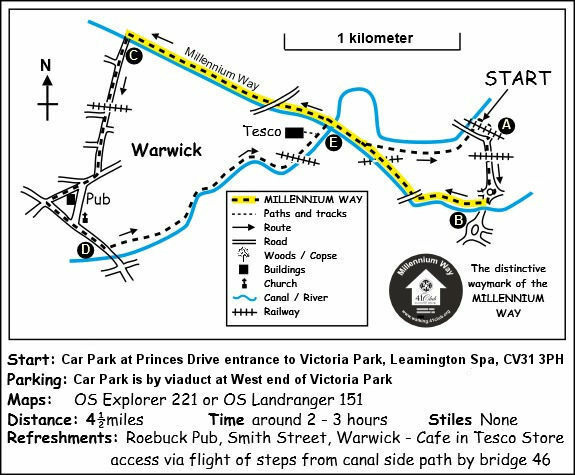 Short sections of the route are along roads but mostly you will be walking along riverbank, near to parks or by the canal. 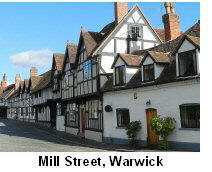 Also, you will pass the historic Warwick Castle and St. John's House Museum near to the centre of Warwick. During the first part of the walk, you will enjoy a short section of The Millennium Way where it follows the Grand Union Canal. Find out more about the walk by clicking on the information icon. From the car park entrance cross Park Drive using the pedestrian crossing then go R to pass under left hand arch of viaduct and proceed up Princes Drive. Pass under the railway bridge to reach the large roundabout. Stay on pavement going to L of roundabout entering Old Warwick Road then cross road via the pedestrian crossing which is just a few yards along. Turn R back towards the roundabout and after 40yds take entrance L to towpath of Grand Union Canal going R to keep canal on left hand side. (You have now joined The Millennium Way). Stay along the Grand Union canal towpath and go under bridge 43 then past The Moorings Pub. Continue for approx 1.5 miles and after passing under bridge 49 then turn R up the slipway to reach the main road. (Here we leave the Millennium Way). Turn R on main road to cross bridge over canal to head into Warwick. Continue along main road to pass under railway bridge and passing Railway Pub on L. Continue past Great Western pub and entrance to Warwick Railway Station. Pass entrance to Priory Park and continue to main road junction. Cross over road via pedestrian crossing and go R past St John's House (a museum with free entry) Just past St. John's House at the junction of three roads, take the middle road of Smith Street a road with some independent shops and a wide range of places to eat. Note: The Roebuck Inn your R (The Roebuck Inn is Warwick's oldest Public House, dating back to 1470 also dog friendly) At the top of the road is the old East Gate into Warwick with St Peters Chapel on top. At the top Smith Street turn L down Castle Hill to the roundabout. Cross roundabout to continue down the A 425 passing St. Nicholas Church on your L. (Note the entrance to Warwick Castle on R, and picturesque Mill Street to left of entrance). Walkers may wish to divert from the walk route to walk into Mill Street and view the cobbled street with impressive timber framed buildings to either side. Returning to the walk route, continue past St. Nicholas Church, down main road (Banbury Road) to pass the main entrances to St. Nicholas park. Just a few yards before reaching the bridge you must take the flight of steps L (signed Centenary Way) into the park. 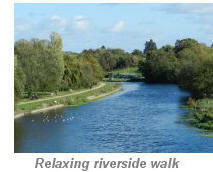 (A short detour onto the bridge will give you the iconic view of Warwick Castle seen in the picture). At the bottom of the steps go past "Warwick Boats" to find the riverside path. Continue along path with river to your R (A lovely picnic spot).Soon you will reach a large footbridge spanning the river ( do not cross bridge ) and here you should cross cycle track and veer slightly R on the grass track with river R and rear of houses L. Soon you arrive a little closer to the river to walk along a pleasant tree-lined riverside track. Continue on under railway bridge to reach the viaduct. Go under arch of viaduct then go immediately L to find metal steps which will take you up to the canal towpath. (You have now rejoined the section of the Millennium Way which you walked earlier). Go L on towpath with canal R to go under bridge 45. After approx 150 yards take footpath L (signposted Link to Princes Drive), and continue along narrow track between fences with railway in cutting to your R. Eventually you will rejoin the river on your L . Stay ahead to pass by a weir along narrow track when a viaduct soon comes into view. Leaving the riverside walk here you will emerge on to the main road to take the pedestrian crossing to cross road back into the car park adjoining Victoria Park. 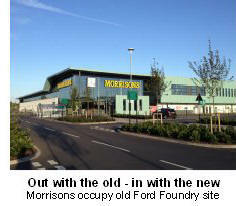 The new Morrison supermarket development is on the site of the former Ford Motor Company foundry. This was an industrial site for 126 years before being demolished in 2010. 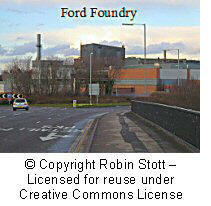 Shops and offices are replacing the old plant, with the promise of 1,200 new jobs. The Grand Union canal first crosses the GWR line to Birmingham Snow Hill built by Brunel and secondly the river Avon. St John's House Museum is a historic 17th century house, owned by the Earl of Warwick as a family residence until 1960, when it was given to the County Council and became a museum of social history and the story of the Royal Warwickshire Fusiliers. When reaching St. Nicholas church, Mill Street is directly ahead, to the left of the castle entrance. This street was one of the few areas to survive the Great Fire of 1694, which destroyed most of medieval Warwick. It is lined with particularly attractive timber-framed houses. The town was rebuilt very quickly in the early 18th century, with brick and stone houses (much safer than timber-frame). Mill Street was the original entry to Warwick, over a medieval Avon bridge, the remains of which can be seen from Mill Garden (entry by donation to charity in summer) at the end of the street. This fine garden also provides a spectacular view of the castle and weir. .The A455 road bridge over the Avon also gives a splendid view of the castle and boat club. The rear of the Tesco superstore was the site of Avon power station, an electricity generating station built by a tramway company to supply power to the tramway (which ran along Emscote Road between Warwick and Leamington in the 1930’s) and to local residents. It was demolished in 1975. The walk ends at Victoria Park, which until the 1830s was just part of farmland on the edge of the growing spa town. In the middle of the nineteenth century Leamington Cricket club made their first home there. In 1899 the park was extensively landscaped and redesigned celebrate the Diamond Jubilee of Queen Victoria. The bowling greens are amongst the best in England hosting the English Women's Bowling Championships annually as well as Women's World Bowling Championships in 1996 and 2004.